Rock and roll history lived on last night at Jones Beach when original Foreigner band members Lou Gramm, Al Greenwood and Ian McDonald joined the band for an impromptu performance at Jones Beach. It was the first time these members performed together since 1980. Here please find photos and video, along with an exclusive quote from Mick Jones, founding member and lead guitarist. (July 21, 2017) – “I Want To Know What Love Is.” “Cold As Ice.” “Hot Blooded.” “Juke Box Hero.” FOREIGNER, the band behind these classic and iconic songs, turns 40 this year and is celebrating this milestone by headlining amphitheaters and arenas around the world. 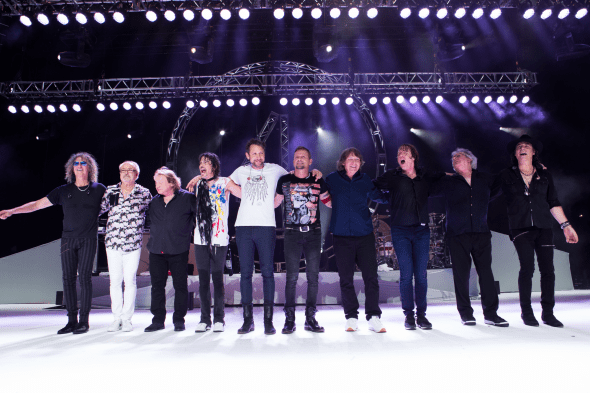 On July 20th, one of rock’s most desired reunions took place when original band members Lou Gramm, Al Greenwood, and Ian McDonald joined Foreigner on stage at the Northwell Health Jones Beach Theatre, New York for a memorable rendition of some of Foreigner’s biggest hits. For the US shows presented by Live Nation, Foreigner will be joined by their good friends Cheap Trick — who are also celebrating 40 years since the release of their self-titled debut album — and special guest Jason Bonham who will be bringing the music of Led Zeppelin to great night of rock ’n’ roll. Tickets are available at www.livenation.com. To coincide with the tour, FOREIGNER–Mick Jones (lead guitar), Kelly Hansen (lead vocals), Jeff Pilson (bass, vocals), Tom Gimbel (rhythm guitar, sax, vocals), Michael Bluestein (keyboards), Bruce Watson (guitar) and Chris Frazier (drums) – has released a celebratory 40th anniversary album that features forty FOREIGNER tracks throughout the years entitled 40 – Forty Hits From Forty Years (RHINO). This album is a comprehensive compilation of original hits and several tracks from the current lineup with Kelly Hansen on vocals including “Can’t Slow Down,” “Too Late,” and the Top 20 AC hit “When It Comes To Love.” The album also features two new songs, “The Flame Still Burns,” and “Give My Life For Love,” a brand new song by Jones. Since the 1977 release of their first hit “Feels Like The First Time” and their self-titled debut album on Atlantic Records, FOREIGNER has been universally hailed as one of the world’s most popular rock acts with 10 multi-platinum albums, 16 Top 30 hits, and worldwide album sales exceeding 75 million. Responsible for some of rock and roll’s most enduring anthems including “Juke Box Hero,” “Cold as Ice,” “Feels Like The First Time,” “Urgent,” “Head Games,” “Say You Will,” “Dirty White Boy,” “Long, Long Way From Home,” and the worldwide #1 hit, “I Want To Know What Love Is,” FOREIGNER continues to rock the charts forty years into the game. Recent albums including Juke Box Heroes, a new compilation of digitally recorded Foreigner hits, and The Best of Foreigner 4 & More, recorded live from The Borgata, Atlantic City, both entered the Billboard Top 200 chart. Foreigner also featured strongly in every category in Billboard’s recently released “Greatest of All Time” listing. Catalog sales often eclipse those of Aerosmith, The Rolling Stones, The Who, Def Leppard, Van Halen and most of their Classic Rock peers (Source: Nielsen SoundScan 2/11/16 – 2/3/16). Check out the US tour at any of the following stops, with more dates to be announced in the coming weeks and posted on the band’s official website. Fans can check out livenation.com for updates on tour dates and news.